Chocolate Cake with Caramel Frosting is two chocolate cake rounds torted into four layers with homemade caramel frosting between each layer and bits of milky way on top! Sometimes I wish I owned a cake business where I could bake just one cake for someone every single day. I love coming up with new cake ideas, and I just love making them! I hate having cake leftovers, sitting on my kitchen counter, staring at me and tempting me. So if I had someone to give the cake to, it would be a perfect solution! Have you tried my Chocolate Cake with Chocolate Mousse Filling? It’s the bomb.com. And this Chocolate Cake with Oreo Cream Filling is also quite fantastic. 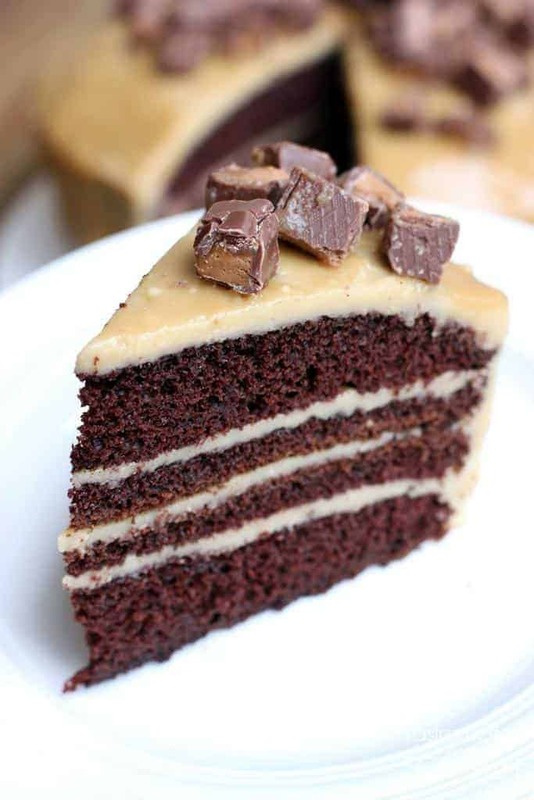 And now comes this Chocolate Cake with Caramel Frosting. It has caramel frosting, people. Need I say more? CARMEL FROSTING. OHH, and it has milky ways on top. The End. Add eggs, milk, oil and vanilla and beat on medium speed for about 2 minutes. Stir in the boiling water (your batter will be very thin--that's OK!). Pour batter into cake pans. Allow to cool in the pan for 10 minutes; remove cakes to wire racks. Cool completely. In a medium saucepan over medium heat add the butter and brown sugar. Stir well and heat to boiling. Boil stirring constantly, for 2 minutes. Stir in the milk and bring back to a low boil. Immediately remove from heat. Stir in vanilla. Allow mixture to cool for several minutes. Add 1 1/2 cups of powdered sugar and mix until smooth. At this point I like to set aside 1/2 cup of this runny frosting for drizzling on top of the cake after I've frosted it. 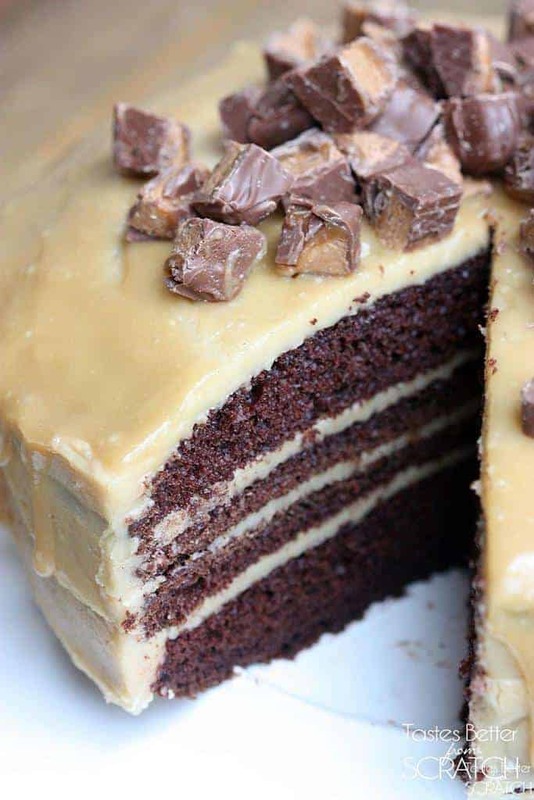 Place your first cake layer on your cake serving plate and spread a big spoonful of caramel frosting over it. Repeat with the remaining cake layers, adding a layer of caramel frosting between each layer of cake. Gently pour remaining frosting on top of the cake and smooth it across the top and down the sides with a spatula until you've covered the cake completely. 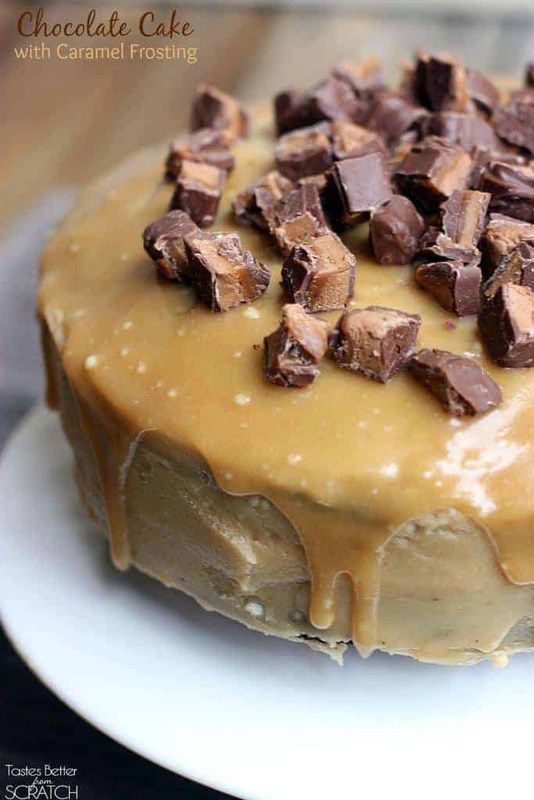 Drizzle reserved caramel frosting over the top. Top cake with chopped milky ways or other candy, if desired. Craving a slice right now.. this cake is just incredible! It’s seriously so yummy! Hope you get a chance to try it! This is great stuff. Love your blog and recipes, hope to have you as our official recipe partner ! 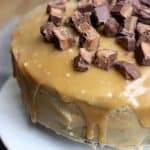 Can you use the recipe for your Homeade Caramel Sauce and just thicken it some with powdered sugar, or it is completely different from the Caramel Icing? Hi Linda, I think that should work great! Let me know how you like it!